a passion to prepare and a pleasure to eat. master. By applying these techniques you are going to become a Rock Star of the grill, famous with your family and friends for serving the most delicious steaks they've ever eaten. By the way, we guarantee if you buy a copy of this book you'll be able to out-cook your brother-in-law! I believe this book will really help me become the master of cooking the Perfect Steak. After recently reading this book I am extremely excited to try my new found knowledge into cooking great steaks. There are a heap of in depth techniques in this book that I never knew existed in the steak world. Like the importance marbling on a steak and the best oils and salts to use to make it delicious and tender. If you're looking for a how to guide to creating awesome steaks, then look no further because this guy knows his stuff! 5.0 out of 5 starsAwesome Angus! I'm a terrible cook and somehow I impressed my dinner party with perfectly cooked steaks. Great detail but still very simple and informative. Great book covered so many basic things which we usually don't care while cooking steaks. I have just printed all the grill guides in the book they really useful. Congratulations on writing a great book! Starts out with what a signature steak is and anintroduction to the author and how he was raised. List of reviews from authors other cookbooks at Amazon. Introduction about what a signature steak is. Chapters on where, what and why. Sidenotes also are highlighted in a different background color so you get the key notes easier. Steak terminology is next. I don't know about you but I just really want to get to the cooking part. I don't think I really need to know the intricate details. Charts, diagrams and how to select your steak. Colorful pictures throughout. Everything you need to know about grilling, cleaning, etc. Liked the story of him visiting his Aussie friend to discover the filthy grill he had to clean first. Recipes, once you get to them show a colorful photo and list of ingredients. Not sure if you can substitute for healthy dietary needs. Preparation and cooking instructions are included. There is no nutritional information. Different utensils needed for the grill are shown and discussed at the end. Didn't care for this book because it was so long I just wanted a brief intro and then onto the recipes. This is anything but that. It's so involved and at times complicated. 5.0 out of 5 starsOriginal and Very informative book! You can learn all the techniques, tips, and even timing from this book!. From all the way to end result of dry and wet-aged meat. The book said wet-aged meat is much more tender meat because it's been soaked to it's own juices, and it can develop a certain taste which is called "serumy"..Wow!.I didn't even know about that though maybe because i just seldom eat steak. Anyway but since i read this book, i definitely much more aware every time i eat in a restaurant with steak..i already know exactly how and what type of process they used to do it..
As well on preparing and to actually grilling the steak, to even salt or to not salt!, and you should use a high quality of salt, comes in the form of salt flakes. You can even learn choosing the right type of oil. And also the book shows even the smoke point chart to refer for temperature to match the oil into it. You can see all of them inside. This is really informative book in terms of steaks signature, as the book title. Highly recommended indeed! 5.0 out of 5 starsWho knew???!!!! First, let me say that if I had read this book years ago, I would have saved a lot of money by not making steaks that were impossible to eat. Making a steak was kinda like buying a lottery ticket Sometimes it turned out great and sometimes the only ones hitting the jackpot were my dogs. It looks so simple. Throw the steaks on the grill andpray for the best. If it doesn't turn out great, it was the butcher's fault. Let this review serve as an apology to all those butchers I've malaigned over the years. I didn't write this review until I actually grilled a steak. I used a choice cut rather than prime so I could see if there was a difference using the cuts I was used to. Wow. What a difference. It's no harder to cook a steak this way than it is to just throwing it on the grill. I think the biggest difference is in knowing what is actually happening and how to control the good stuff and avoiding the common mistakes. Without this book,you'll probably make a good steak now and then. With it, you'll be making great steaks consistently. There is a huge wealth of information contained in this book from the difference between grass fed or grain fed beef to how to actually age your beef in your own refrigerator. Even if you aren't interested in technicalities like that, the questions of to salt or not to salt and how to properly rest a steak and why are answered. Also busted are popular myths about grill cleaning and such. 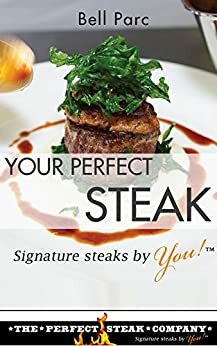 The book is well written and aimed at helping you reach YOUR perfect steak, be that rare or well done, without judgment. There are charts covering the most popular cuts of beef and doneness charts, with information about how to adjust them for variables. I think this book is one of those must have books for anyone who enjoys a good steak. Now, I think I'll head out to the butcher shop and try a piece of prime! i can do that now, knowing I won't waste it. Sorry, pups! If your ooking for a book that gives you all the information to cook the perfect steak, look no further. Bell Parc,s Your perfect steak is an excellent written book that gives you tons of tips and tricks to perfect your cooking of any steak. For instance many cooks decide to cook meat immediately upon removing it from the fridge. He explains how important it is to leave the meat out for at least an hour or so to let it get to room temperature before cooking. You will learn how to age your steaks to increase the tendorizing process and much more. You will also be given a slew of tools need to aid in this process such as using thethermowand meat thermometer to get the exact rare,medium rare doneness you like without having to guess or cut into the meat. Methodically written, he leaves no stones unturned when it comes to making the perfect steak.If I had only one thing I would like to see in a revision is maybe include a few more pan sauces,glazes and some nice herbed butter toppings. i received this book at a discounted rate in exchange for an honest and unbiased review. This is a great cookbook that helps you learn how to cook the perfect steak. I have had issues with cooking steaks ever since I started preparing dinners for my family. I just couldn't ever get it right, but this cook book has helped me immensely. I highly recommend it to anyone that is struggling to cook the perfect steak to ones who are great at cooking steak, but might want some new techniques. Full Disclosure: I was blessed to receive this item at a discounted price or for free in exchange for my testing, inspecting and reviewing it. I received no compensation for my review and always give my honest and unbiased opinion of each product. My words and the rating I provided are my own and are based on my own personal experience with this item.